Can Spokane and Catholic Charities solve homelessness? Catholic Charities CEO Rob McCann in front of the new Buder Haven. Volando Peeples says his days of couch-hopping are done. Peeples, 42, has one of the 51 apartments in Catholic Charities' Buder Haven apartment complex. It's his own space, one he's decorated with comic books and issues of Dope magazine. On one wall, Peeples has posted years of poetry, prose and rap lyrics, all laminated. He points to a particular favorite — a poem that he wrote back when he was in the Spokane County Jail. "It reminds me every time when I sin, we share tears," Peeples says. "When I'm down and heartbroken and stuff." Peeples talks about the deaths of his dad and his brother. "All my friends and family, they're dying off," Peeples says. "From stupid stuff. Little bitty things, man." But this place represents a sudden turn in his luck. His housing specialist at Frontier Behavioral Health helped him apply to get this apartment. "Ah, man. For me? Man," Peeples says. "It means not just something good, it means, like, that storm is about to pass." He says he's gotten focused. He's studying journalism at Spokane Falls Community College. He's improving his credit. "I'm not dependent on nobody else," Peeples says. Buder Haven is one facet in Catholic Charities' bid to end homelessness in Spokane. Like Catholic Charities' other units, Buder Haven has a social service coordinator assigned to it, to assist the formerly homeless get connected with help. "I found out we had counseling in the building," Peeples says. "Then I have people I can talk to. I can open up and be myself and talk about real stuff." This is Spokane's boldest move in solving the homelessness riddle, and it's almost absurdly simple: Give the homeless homes. It's a radical departure from the old model of fighting homelessness, where drug addiction and mental health issues had to be treated before the homeless could be placed in housing. "If you had sat in this office 15 years ago and said, 'Hey Rob, should you take a homeless person who is mentally ill and off their meds ... or who is actively suffering from addiction issues,' and say, 'Here is the key to your apartment?'" says Rob McCann, CEO of Catholic Charities of Spokane. "I would have told you no." But nationally, places like Salt Lake City have pursued the Housing First model: Give the homeless homes, and then use those homes as staging grounds to address their other issues. 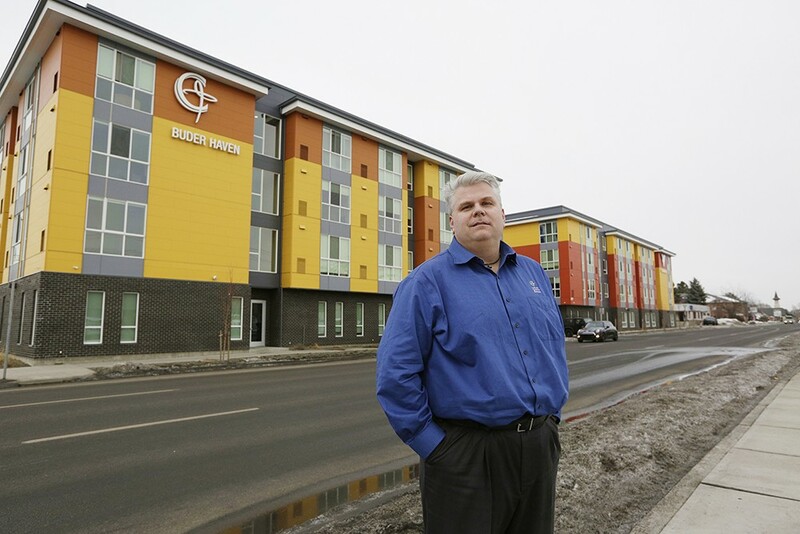 Four years ago, Catholic Charities opened the Father Bach Haven apartment complex right next to the House of Charity, with 50 units of low-income housing aimed directly at the homeless. And while McCann sometimes gets complaints and angry phone calls from neighbors at 2 am, the biggest fears about the apartments becoming a haven for vandalism or violence never came to pass. "When we build a building, crime actually tends to go down," McCann says, due to all the new cameras and eyes added to the neighborhood. "If you build a palace, people who live there will eventually believe they are kings and queens. If you build a dump, people eventually will believe they're trash." So far, thanks to a generous tax-credit market, construction of these sorts of apartment complexes were almost guaranteed to be funded. Tax vouchers from the Spokane Housing Authority allow residents to pay little to no rent. "The rest of the country is actually looking at us as a model on this," Washington Gov. Jay Inslee says regarding Housing First efforts. This past July, Buder Haven opened next door to Volunteers of America's identical apartment complex, the Marilee. Pope Francis Haven and another apartment complex are scheduled to open later this year. Catholic Charities is funded to build one more complex after that. At the same time, Catholic Charities and SNAP are fighting the challenge of homelessness from the other end by focusing on rapid rehousing: As soon as someone first becomes homeless, SNAP assesses who they are, and identifies exactly what they need to get back on their feet as quickly as possible.